Bill of Sale forms. Ready for use. Fast Download. Bill of Sale forms can cover a variety of sales transactions like for vehicles, dogs, cats, horses and exotic animals and items such as furniture, golf carts or jewelry. A written Bill of Sale serves as proof of ownership and protects the rights of both buyer and seller. With Warranties - The seller warrants (or guarantees) that he or she has the authority to transfer legal title to the buyer and that there are no outstanding debts or liabilities for the property. In addition, the seller may warrant that the property is in good working condition. Documents used to transfer ownership of an animal from one owner to another. Covers Dogs, Cat, Birds, Horses and more. Spanish Bill of Sale forms for use when selling or purchasing specific property. Bills of Sale Combo Packages Get 9 forms for just $39.95. Save 73%! Save Money by getting our popular Bills of Sale forms together in one convenient packet AS-IS Bills of Sale Combo Packages Get 5 forms for just $39.95. Save 52%! Save Money by getting our popular AS-IS Bills of Sale forms together in one convenient packet. Pet and Animal Bill of Sale Combo Packages Get 6 forms for just $39.95. Save 67%! These attorney-prepared Bill of Sale forms will ensure that your sell of a pet or animal is legally set out in writing, which will come in handy if there are future disagreements or questions about an... Vehicle Bill of Sale Combo Packages Get 7 forms for just $39.95. Save 63%! Save Money by getting our popular Vehicle Bills of Sale forms together in one convenient packet. There are certain written sales transactions that occur all the time. Real estate sales, automobile purchases, and boat sales certainly come to mind. Finding the right legal forms to ensure a seamless legal transaction in these cases is not a big challenge: the right forms are easy to look up. But some sales aren’t so traditional. While one person’s hobby might include buying a sailboat, another person’s hobby might be raising horses. One man’s motorcycle is another man’s unicycle. And the wackier the sales transactions gets, the harder it can be to find the legal forms to ensure a proper, legal transaction. That’s unless, of course, you know the right places to look. Here at FindLegalForms.com, you’ve come to the right place to put even your wackier purchases and sales down in writing – and we’ll explain exactly how you can do it in three specific instances. It’s one thing to buy a horse, it’s an entirely different thing to buy a monkey. Horses are often viewed as investments, but exotic animals are – forgive the pun – a horse of a different color. Buying exotic animals also carries a certain amount of risks with it, and there are rules and regulations that differ with each state that need to be accounted for. That’s why buying exotic animals, wacky sales transaction that it might be, must have a grounding in rock-solid paperwork like the kind you can find here at FindLegalForms. You’d be surprised how much more trouble it can be to buy an exotic animal if you don’t have the right paperwork to back up your transaction – it’s much better to take the attitude of being safe rather than sorry. Getting yourself from point A to point B isn’t so wacky, but if you do it in a powered parachute or another type of ultralight aircraft, suddenly you’re breaking out of the proverbial box. Of course, even ultralight aircraft can be expensive, which is why it’s important to back this kind of transaction with a bill of sale that will meet all the needs of both parties and document exactly what’s happening so that you have legal recourse if anything bad should happen. The term “ultralight aircraft” can refer to a number of different types of aircraft, as well, so it’s important that you do research and make sure that you have a legal document that applies to the aircraft of your specific purchase or sale. 3. Homemade art and crafts. It’s one thing to buy a painting from someone – it’s an entirely different thing to purchase a home-made, life-size replica of Darth Vader from “Star Wars.” Of course, even these wacky purchases can use some solid legal grounding if you don’t feel right about your investment, but let’s face it – if you’re the kind of person who’s into Darth Vader replicas, you don’t mind taking a risk every once in a while. 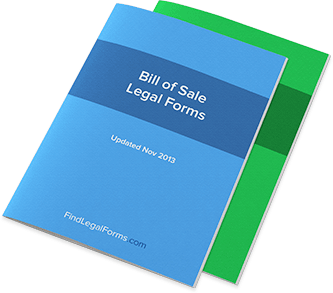 Still, we recommend a General Bill of Sale form for this particular purchase, and you can find one right here at FindLegalForms.com. When you buy something - or when you sell something - it’s customary to receive some sort of proof that the transaction has taken place. When you fill up on gas at the gas station, the automated machine will ask you if you want a receipt on your purchase. When you buy groceries at the grocery store, a long receipt will list off everything you purchased, helping you to understand everything that officially registered at the clerk’s station. These “receipts” are usually automated; but what about a receipt on something that requires a little more legal weight? That’s what a bill of sale will be. When we say “bill of sales in general,” we’re not simply referring to an automobile bill of sale, but to a written contract for anything that’s been sold. Typically, this can represent large property from, yes, automobiles to boats, RVs - anything you have that’s worth a lot of money. A bill of sale is a way for the legal system to verify that both parties agreed to the sale for the agreed-upon price, and that the transaction was indeed valid. So what can you learn about bills of sale that will help you in the future? A number of things. First of all, it’s important to remember that putting sales in writing can be integral to making sure that the sale goes off without a hitch - and if there is a hitch, that you’ll have some sort of legal recourse to make sure that the other party fulfills their end of the bargain. This basic legal power is at the center of what makes the legal system work, helping you to avoid being cheated out of money or property. It’s also important to recognize that bills of sale are typically more appropriate for the larger items you sell - for example, let’s say you were to sell an expensive piece of electronic equipment for a few thousand dollars. If you were trepidacious about making the sale in the first place, then you certainly won’t want to make the sale with only a check in hand. Why? Perhaps the check will bounce, meaning that you’re out of money and you’re not sure where the purchaser will end up. You want to have legal recourse should something unusual happen. This is not only a great way to ensure a smooth transaction, but to give you the peace of mind you need to part with an expensive piece of property. Having a general bill of sale at your disposal - and you can find many printable ones available online - is a great way to give you the confidence you need to make the sale in the first place. If you don’t like using the Internet to sell things - such as finding people on Craigslist - then you can still use a general bill of sale to keep the confidence of a legal transaction on your side.